Iast week, on sunday we see amazing actions by WWE superstars at summer slam.The results are quite shockings, most of the people were thinking that Braun Storwman will cash in his money in the bank contract after Roman Reign defeats Brock lesnar.But totally opposite was happened, Braun got beating by lesnar and Roman wins his title. 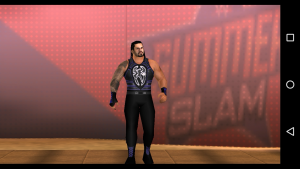 This yerars summer slam was very thrilling.Now i’m giving you new gears of two popular wwe superstars of summer slam 2k19.Thet are Daniel bryan and Roman Reigns.here are some screenshots of their new look. 1.Download svr 2011 iso from the link below. 2.Download wwe 2k19 v1.2 psp mod.It is mandatory to download this mod v1.2 from the link I have given below.Because there are some problems which you will face, if you are using some other psp folder created by different modders. 3.For android Download Z archiver app from play store and for PC download winrar. 4.Now extract mod v1.2 psp.7z file into your internal storage of your device via Z archiver.If you are extracting it in PC then go to libraries>>docuents>>psp>>psp extract here. 5.After extracting psp.7z (v1.2) download SS gears.7z file from link below.Extract it in psp>>textures>>ULUS10543.While extracting this file will ask password and to get the password you have to watch this video till end. That’s it now you can enjoy wwe 2k19 mod with latest gears and superstars.If you face any problem while playing this game.Just go through this setting video. Share your thoughts in comment section and For more stuff like that visit our youtube channel,don’t forget to subscribe and follow us on Facebook and Instagram.